This is the Jetpack display with all of the indicators visible. You will not see all the indicators on at the same time. The Jetpack is off, not receiving power or the screen is in power saving mode. More bars indicate more signal strength. 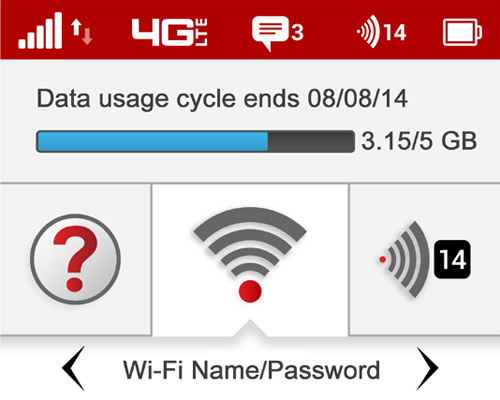 If this icon displays, data is being transferred between your Jetpack and connected devices. If this icon displays, it shows the number of devices connected to your Jetpack. 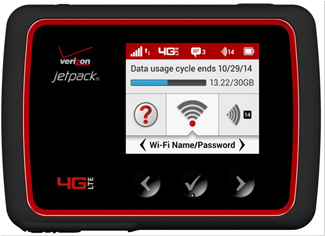 If this icon displays, your Jetpack is connected to a network outside the home network area. If this icon displays, you have unread Verizon system messages. This displays remaining battery power. This displays when the Jetpack is connected to AC power. This displays when another device is connected to the Jetpack is charging via a USB cable.